In UPSC Civil Services Exam, because of the tight competition, even 1 mark counts. Clear IAS Team is happy that our convictions turned right on many occasions and there were lot many direct and indirect questions in actual UPSC exam from Clear IAS Mains High Value Answer Writing Program, Clear IAS Mains Full Length Free Mock Tests and Clear IAS free online study materials. Here is the comparison of clearias.com questions with official UPSC Mains 2014 GS2 Paper. [Clear IAS Free Study Material] WTO and TFA. [UPSC 2014 Qn] – India has recently signed to become founding member of New Development Bank (NDB) and also the Asian Infrastructure Investment Bank (AIIB). How will the role of the two Banks be different? Discuss the strategic significance of these two Banks for India. [UPSC 2014 Qn] – With respect to the South China sea, maritime territorial disputes and rising tension affaire the need for safeguarding maritime security to ensure freedom of navigation and ever flight throughout the region. In this context, discuss the bilateral issues between India and China. [UPSC 2014 Qn] – National Human Rights Commission (NHRC) in India can be most effective when its tasks are adequately supported by other mechanisms that ensure the accountability of a government. In light of above observation assess the role of NHRC as an effective complement to the judiciary and other institutions in promoting and protecting human rights standards. [UPSC 2014 Qn] – The penetration of Self Help Groups (SHGs) in rural areas in promoting participation in development programmes is facing socio-cultural hurdles. Examine. [UPSC 2014 Qn] – Though the federal principle is dominant in our Constitution and that priniciple is one of its basic features, but it is equally true that federalism under the Indian Constitution leans in favour of a strong Centre, a feature that militates against the concept of strong federalism. 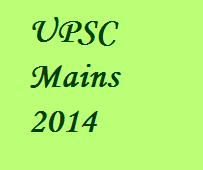 [UPSC 2014 Qn] – Has the Cadre based Civil Services Organization been the cause of slow in India? Critically examine. [UPSC 2014 Qn] – The ‘Powers, Privileges and Immunities of Parliament and its Members’ as envisaged in Article 105 of the Constitution leave room for a large number of un-codified and un-enumerated privileges to continue. Assess the reasons for the absence of legal codification of the ‘parliamentary privileges’. How can this problem be addressed? [UPSC 2014 Qn] – Starting from inventing the ‘basic structure’ doctrine, the judiciary has played a highly proactive role in ensuring that India develops into a thriving democracy. In light of the statement, evaluate the role played by judicial activism in achieving the ideals of democracy. [Clear IAS Free Study Material] – Freedom of speech and expression. [UPSC 2014 Qn] – What do understand by the concept “freedom of speech and expression”? Does it cover hate speech also? Why do the films in India stand on a slightly different plane from other forms of expression? Discuss. [Clear IAS Free Study Material] – Death Sentences. One can give some 2000 questions and 10,000+ page study material and claim that many questions in actual UPSC exam came from them. But Clear IAS took a focused and simple path. Our materials were small in size. We provided only around 75 questions each for GS1, GS2, and GS3. There were 54 essay topic selections and 64 questions for GS4 (Ethics) paper. Our online study materials, provided a guidance for note preparation on the important topics, but these too were never long or heavy.